After many months of digestive issues and testing, I finally visited a surgeon to make plans to have my gallbladder removed which took place last week. It was an easy surgery, and I am thrilled to be rid of my pesky gallbladder which has been giving me issues for over a year. When I asked the surgeon about limitations to my diet after surgery, he said there are no limitations, but that I should start off with a soft, bland diet for a day or two immediately post-op. Thinking about ideas I could prepare ahead of time, I made a batch of delicious roasted chicken broth, and this creamy soup made from white beans. 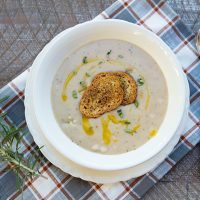 This soup is very comforting, delicious, and healthy too as the cannellini beans are used to thicken the soup rather than using heavy cream as many other soups do. Beans are nutrient rich, high in fiber, and just 1/2 cup of beans provides 7 grams of protein, the same amount as in 1 ounce of chicken, meat or fish making beans a great source of protein for vegetarians. This is soup I make from time to time, changing the ingredients depending on what I have on hand. You can cook your own beans from dried beans, or if you want to simplify things, use a good quality canned bean. I have been cooking dried beans in my Instant Pot after soaking them all night and used these beans in my soup. You can use either chickpeas or cannellini beans, although cannellini beans create a creamier soup. 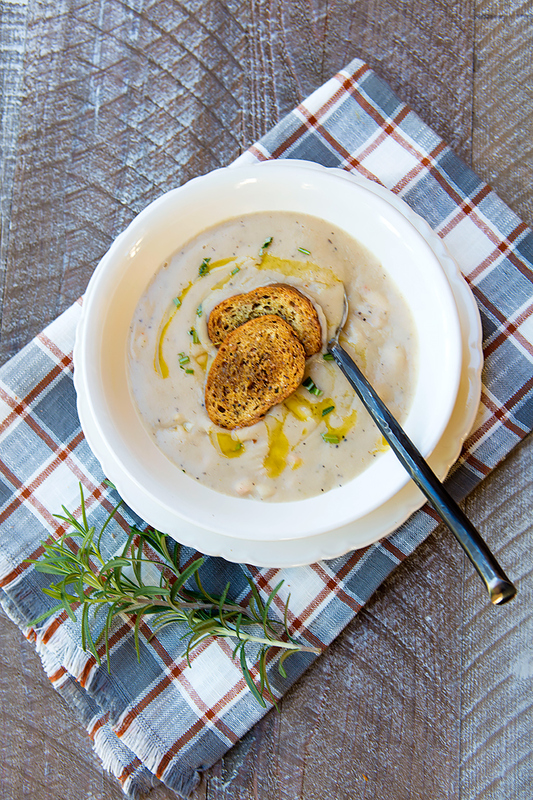 Fresh rosemary, onions, and pancetta help develop the flavors in this soup, bringing the beans to life. However, if you want to keep the soup vegetarian (or vegan), skip the addition of pancetta and use vegetable, not chicken broth. 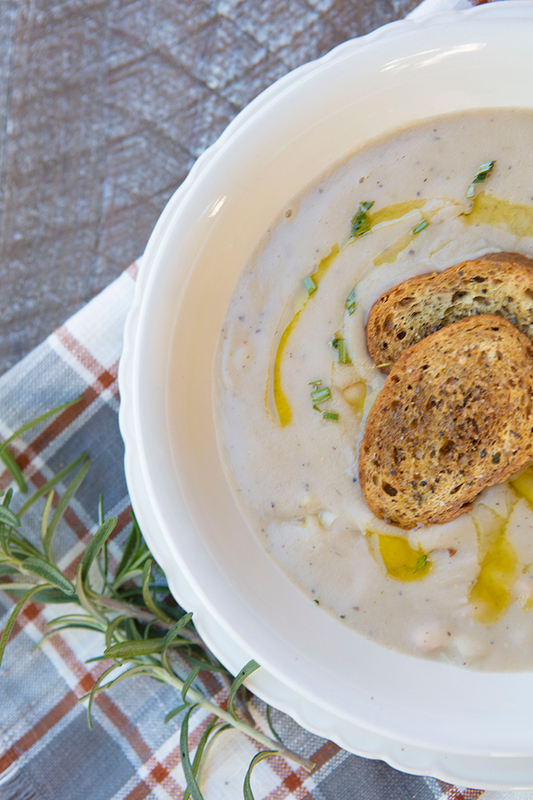 This soup epitomizes Italian peasant cuisine as it uses a few basic ingredients found in almost every pantry to create a delicious, satisfying simple soup. 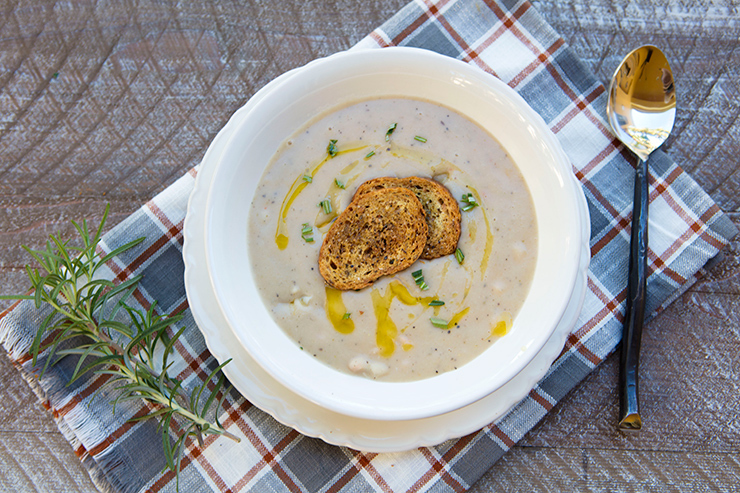 To serve this soup, I used a little additional chopped fresh rosemary, a drizzle of our own extra virgin olive oil, and crispy croutons that I made from stale bread. This soup freezes well so make a double batch if you want. After storing in the refrigerator or freezer the soup does thicken up, but you can quickly fix this by adding a little extra broth or even water to thin the soup when reheating it. This soup is quite filling, so it can easily serve as a main course. Just add a loaf of crusty Italian bread with a crisp salad of mixed greens to complete the meal. A creamy, hearty soup made from canned or dried beans. In a heavy bottomed stockpot over medium flame, heat the oil until lightly smoking. Add the onion, garlic, and pancetta, and cook, stirring often, until the onions are soft and the pancetta has browned, about 8 minutes. Drain and rinse the beans in a sieve, removing 1 1/2 cups of the beans for later. To the onions and pancetta, add the beans, broth, salt, pepper, oregano, and chopped parsley. Bring to a boil, then reduce heat to a simmer and cook for 20 minutes. Cool the mixture to barely warm, then puree in a blender until creamy and smooth. If the soup is too thick, add additional broth until desired thickness has been achieved. Return the soup to the pot, add the reserved beans, and cook on medium low heat until hot. Serve in individual bowls with toppings and enjoy!